Happy Easter 2019! 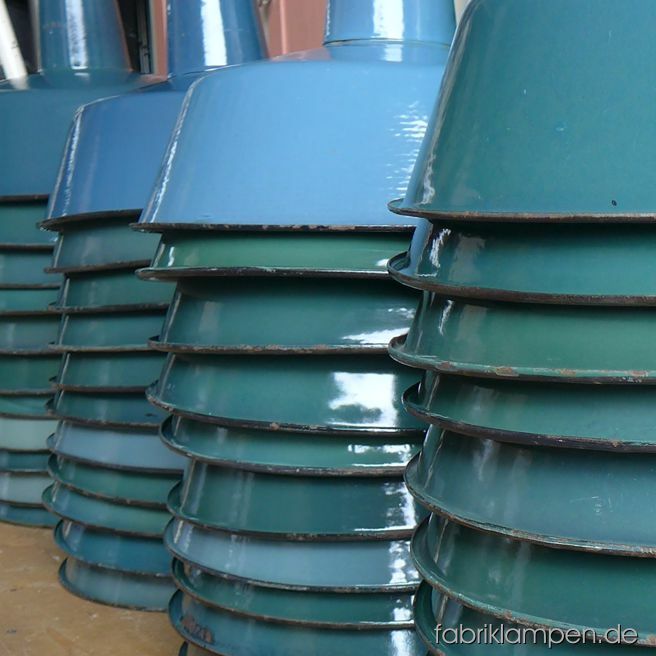 Old green and blue enamel industrial lamps. Much has happened in the last year. 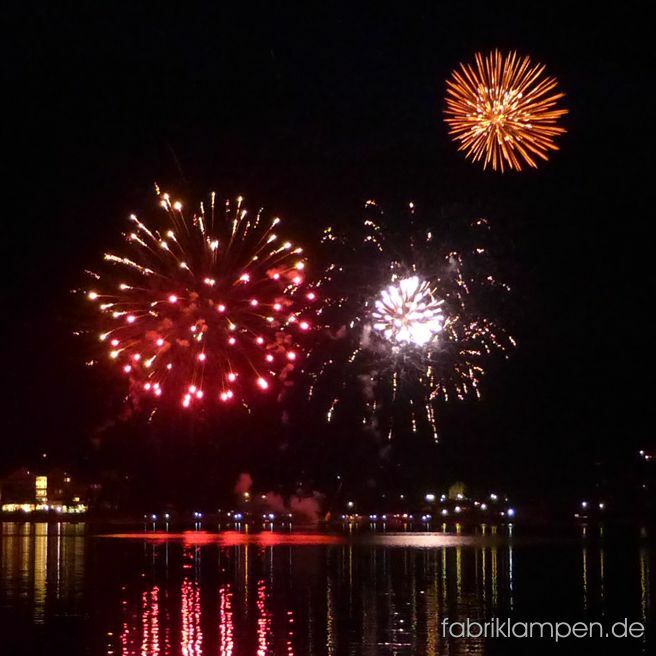 Beside many beautiful projects, we moved from Augsburg to Ravensburg. We feel well at Lake Constance and work as diligently as before. In order to provide a better insight into our lives and activities, we are now also active on Facebook. 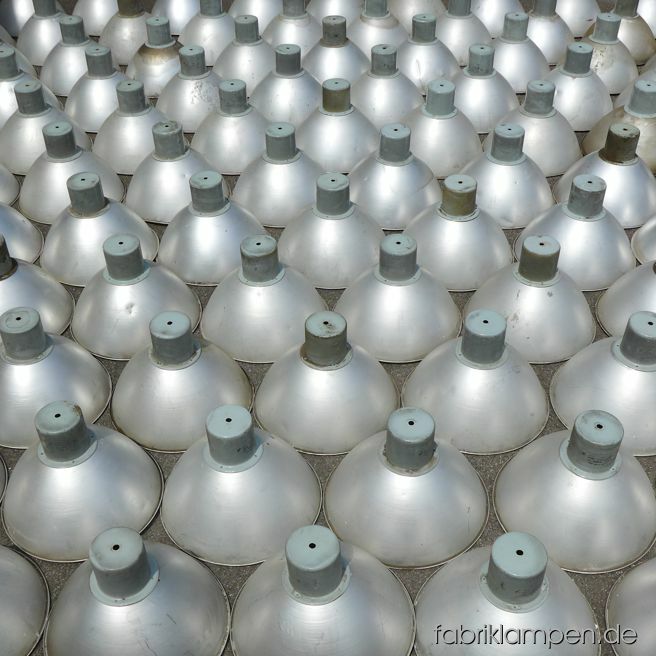 You will find us there, as everywhere, under the name fabriklampen.de. See you soon! 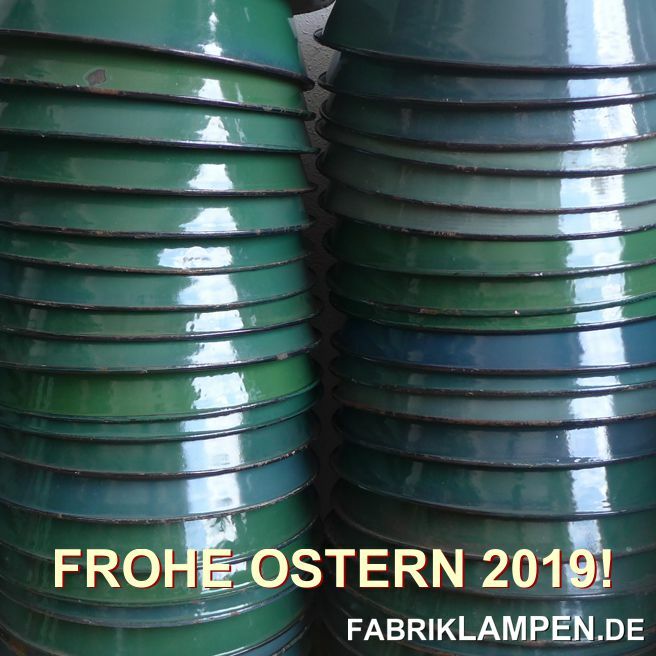 We start the spring 2019 with these colourful lot of old factory lamps. We have 20 pieces of them in stock. Further details and new items can be found at our lamps-site. 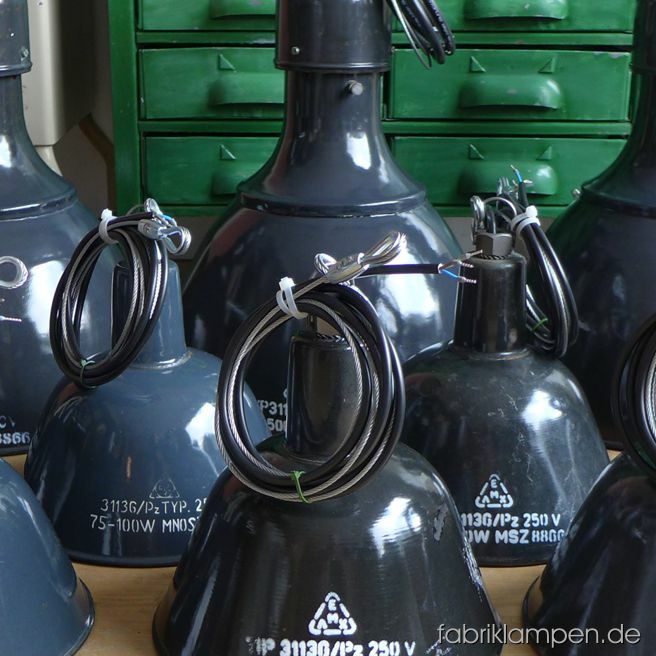 We start the new year 2019 with these nice restored old bunker lamps. We have near 100 pieces of them in stock. Further details can be found at our lamps-site. 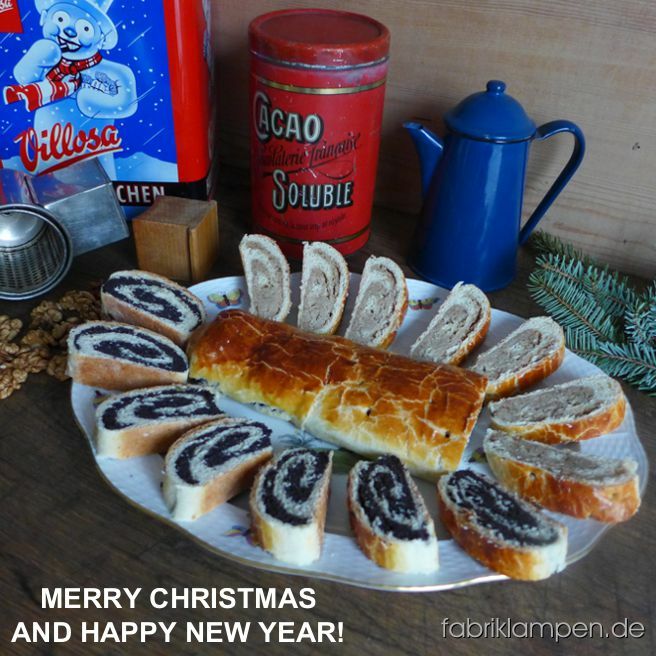 We wish our visitors Merry Christmas and Happy New Year! 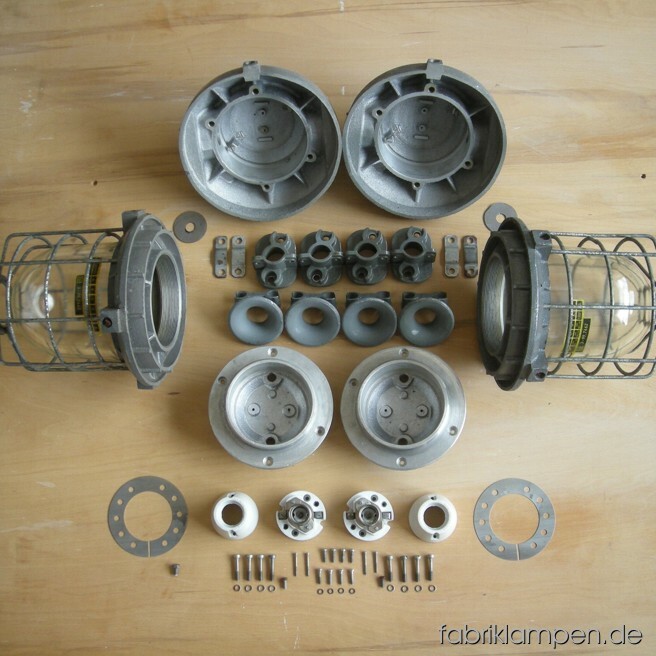 Nice old industrial lamps after arriving. These lamps are rare, so I made some picture. Nice form (the smallest version of these lamps), with traces of age and usage. Partly with white, partly with black inscriptions (hallmarks). 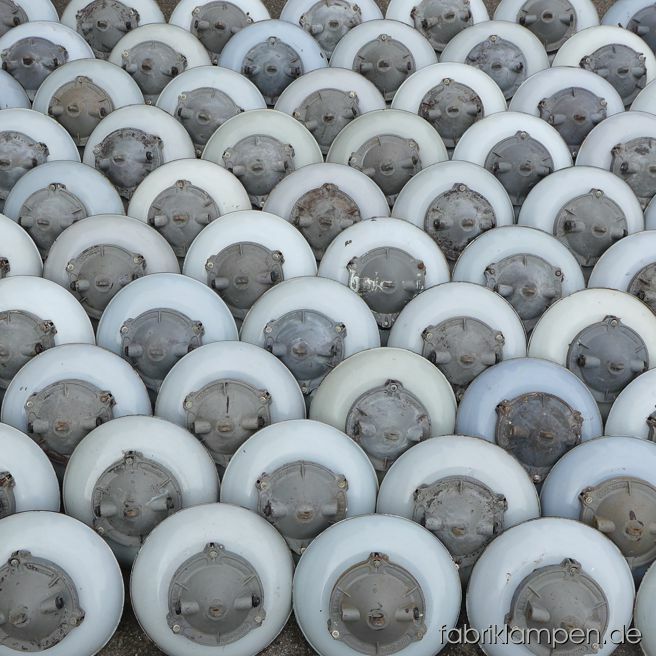 We have them restored, you find these lamps on our lamp-site. We have nice old, restored industrial chairs and stools in stock. Pedestals gently restored, with traces of age and usage. Sits reneved, made of waxed oak. Old pieces, partly from the 1930ies. 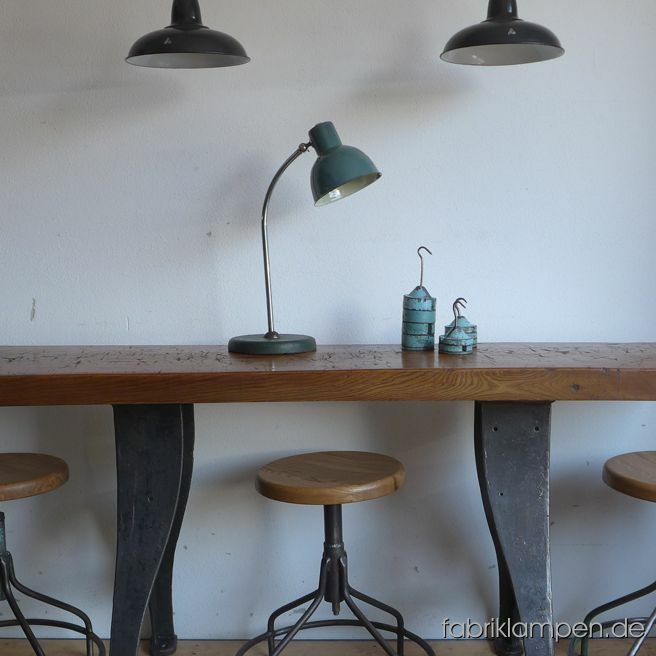 You find on our Furniture-site industrial tables too. Happy Easter 2018! 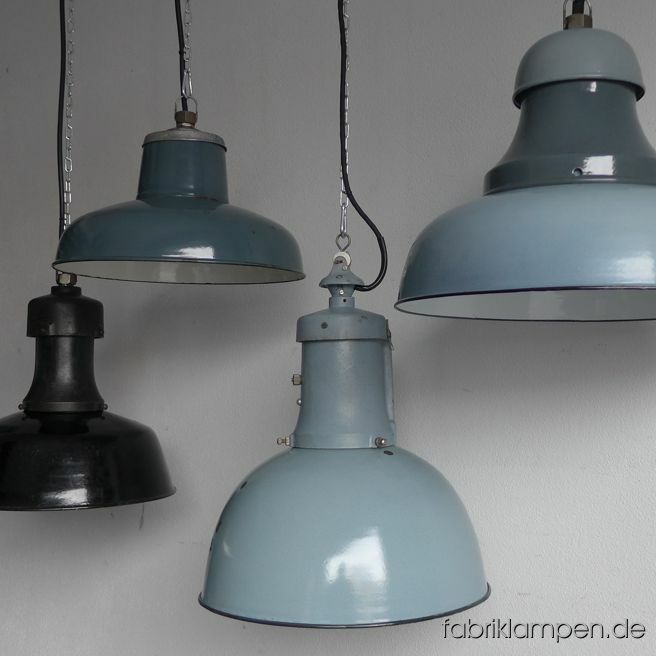 Old blue enamel industrial lamps. 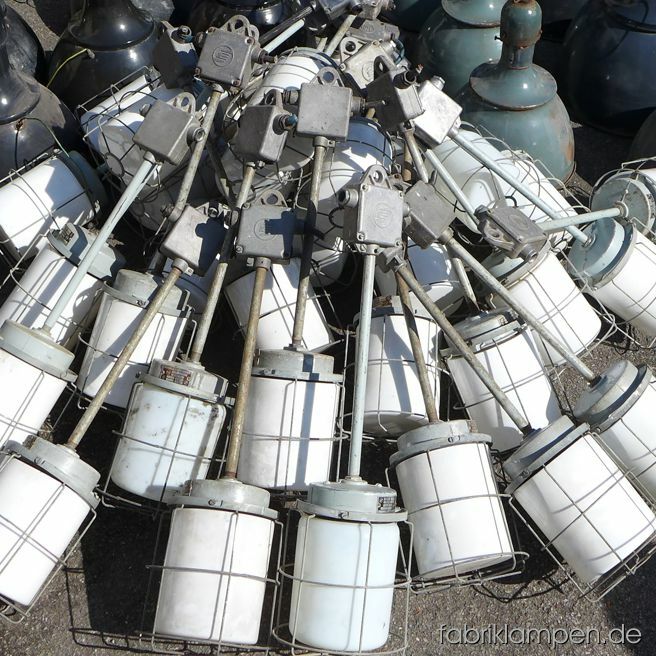 Nice old, partly antique factory lamps. They come in the next days on the site. 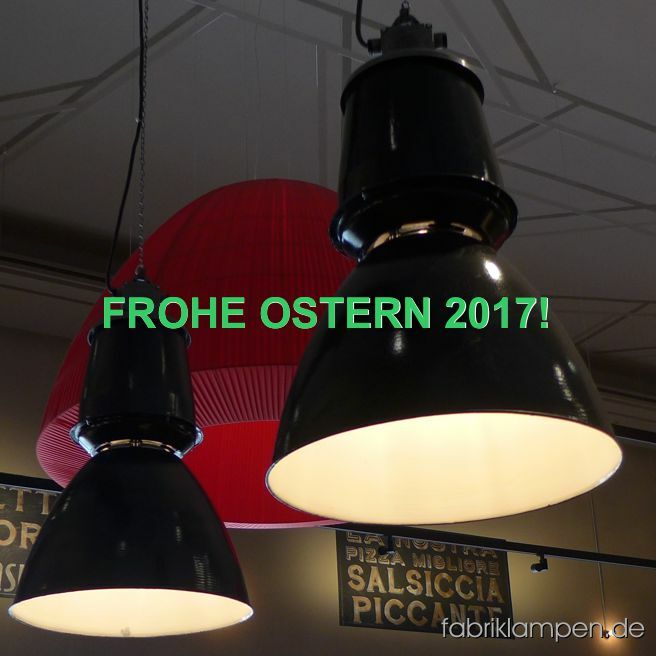 Our old factory lamps (Spreegold-Restaurant, Bikini-House) in the heart of Berlin, April 2017. Happy Easter 2017! Our big old enamel lamps in a pizzeria. 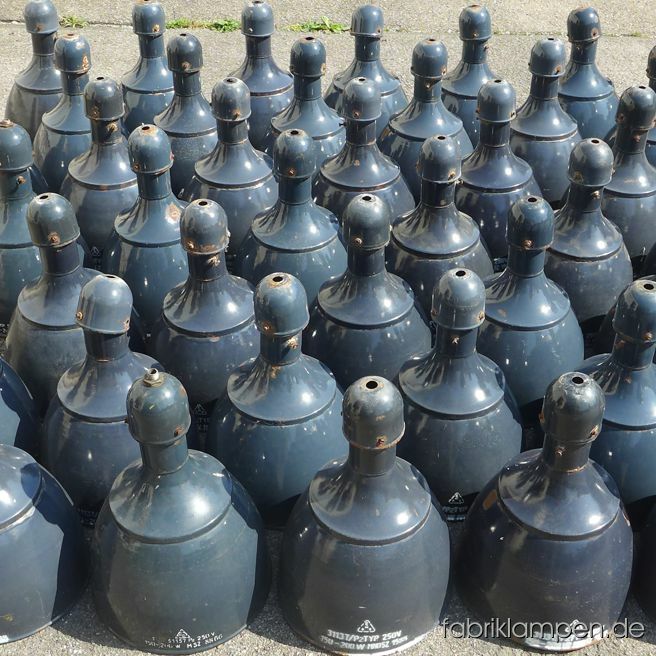 Nice collection of 50 pieces old bunker lamps after arriving. 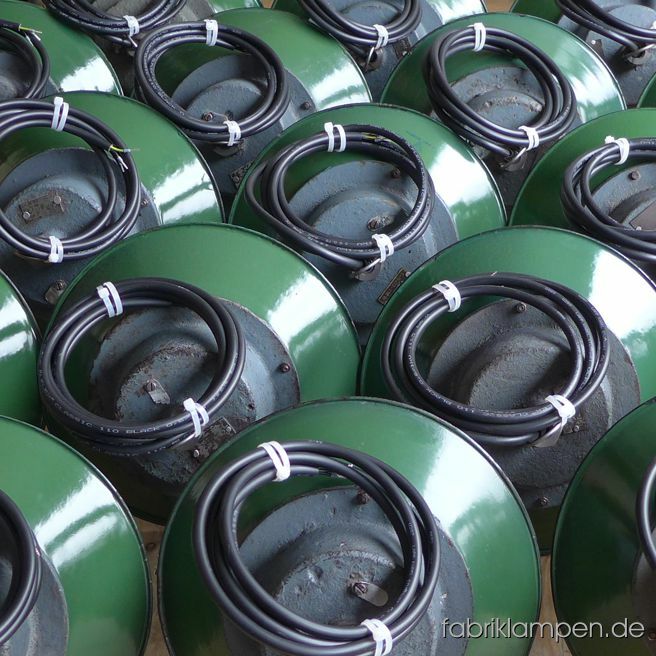 Partly with nice black enamel shades – soon available! Nice collection of colourful factory lamps after arriving, December 2016. We make Christmas holidays from 19. December till 09. January. 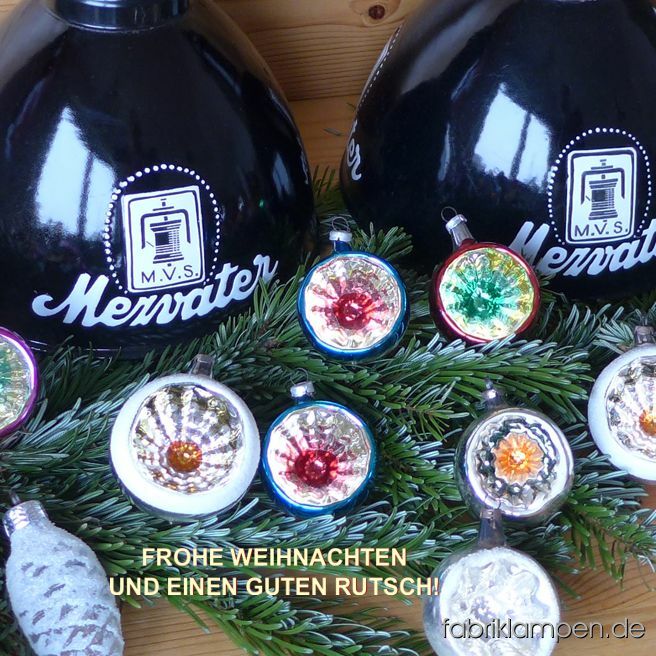 We wish our visitors Merry Christmas and Happy New Year! We are back after our summer holiday. On the way back we brought home some beautiful black factory lamps with marking (lamps on the pictures in original condition). We have summer holiday till early September. We wish you a beautiful summer time! 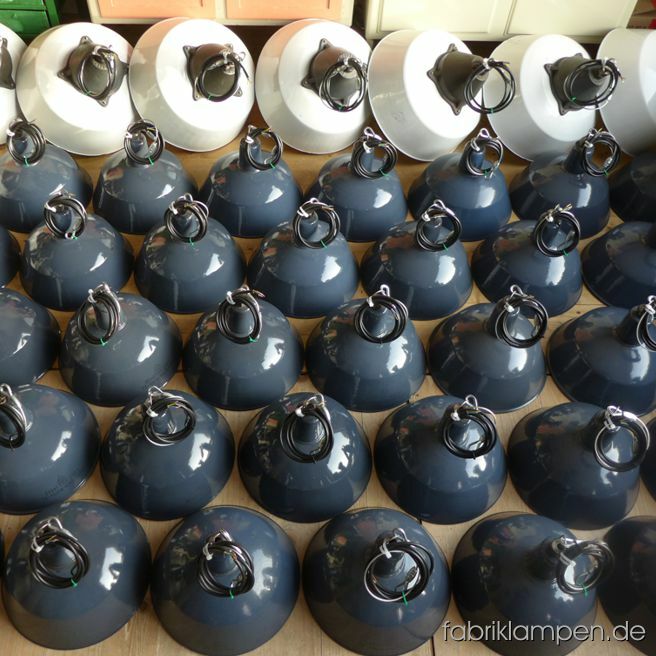 Nice black and blue enamel lamp shades after arriving – a group of about 150 nice factory lamps in grayish blue and black in various sizes. Permanent in stock. 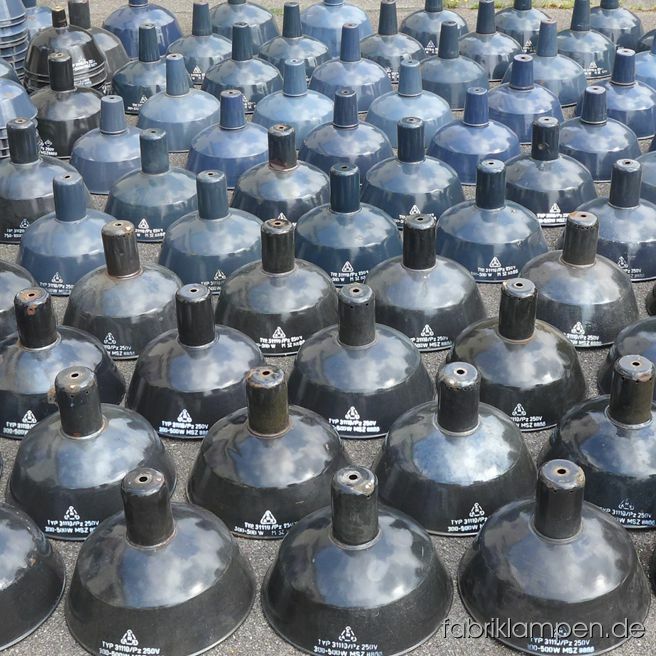 Nice old ship lamps with aluminium domes after arriving – a very rare found. Currently we have 30 pieces of them in stock. 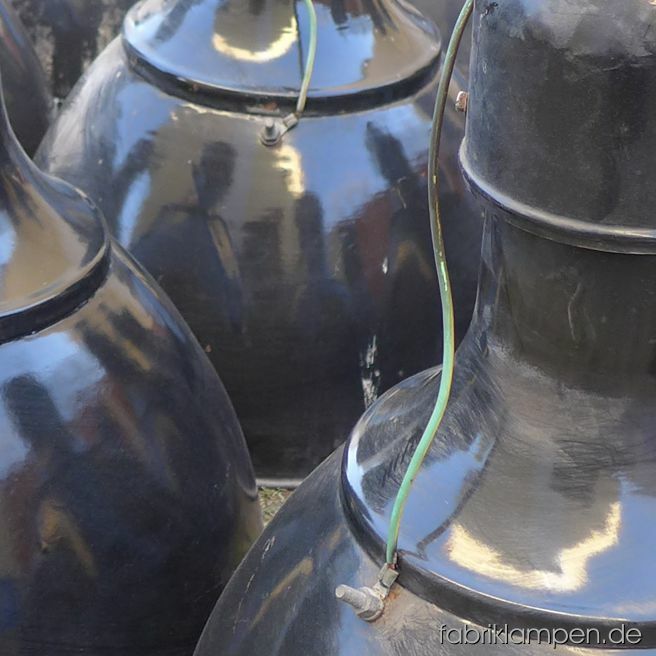 Partly with strong traces of age (rust on the shades) – the domes are intact. Soon available! 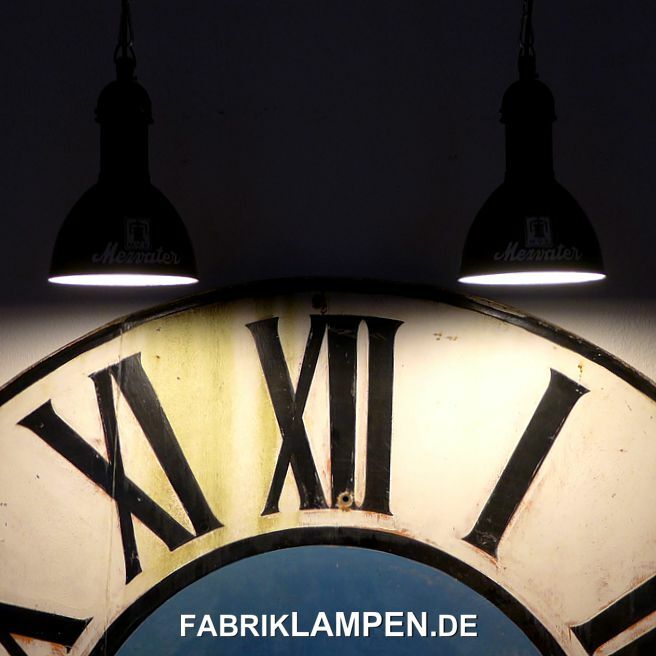 Impressions of June 2016: factory lamps supplied to Northern Germany, on the way back a cup of cappuccino in Lower Saxony with lamps from fabriklampen.de. 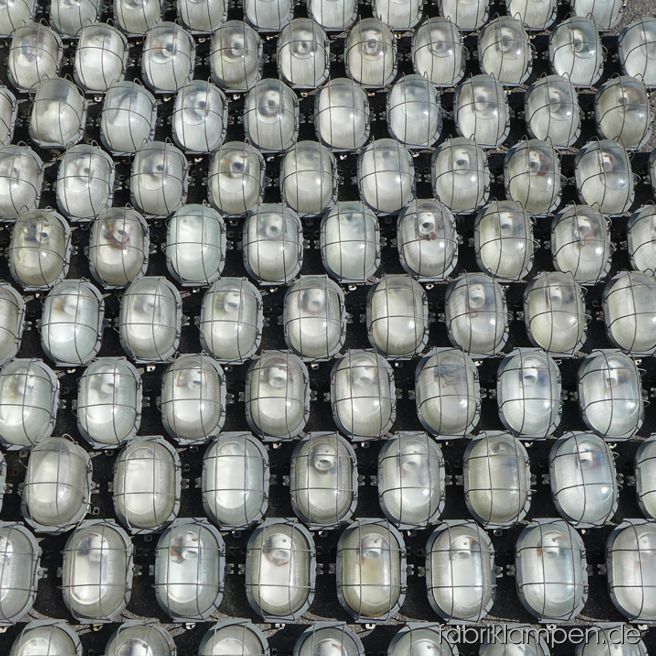 Casted iron lamp heads with chain suspensions, lamp scizzors, old window shutters packed on pallet, lamps arriving to the building site. 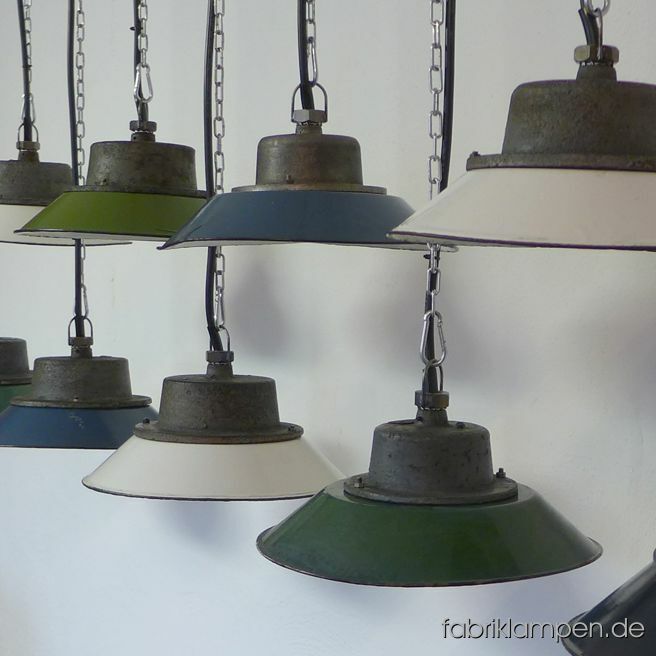 Nice group of old pastel green industrial lamps and wall lamps for a residential project in an old textile factory in Schwitzerland. 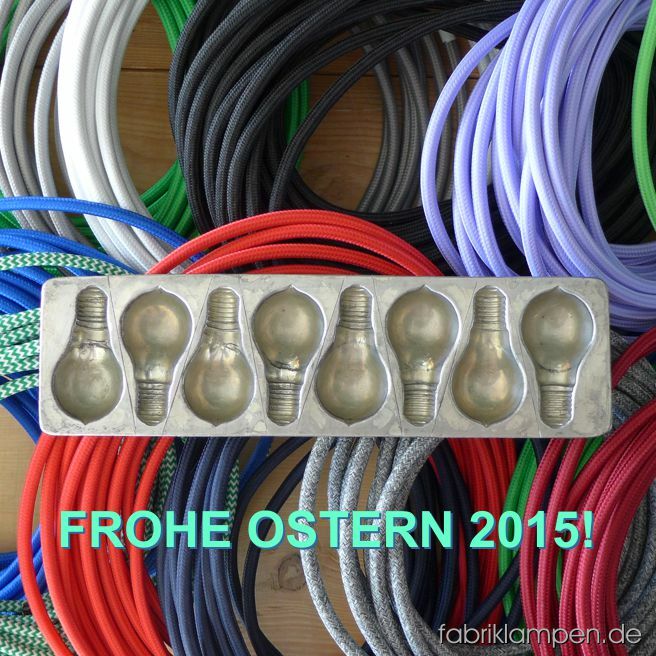 Happy Easter 2015! Nice green hallmarked (Karl Engel) enamel lamps from the 1930ies. 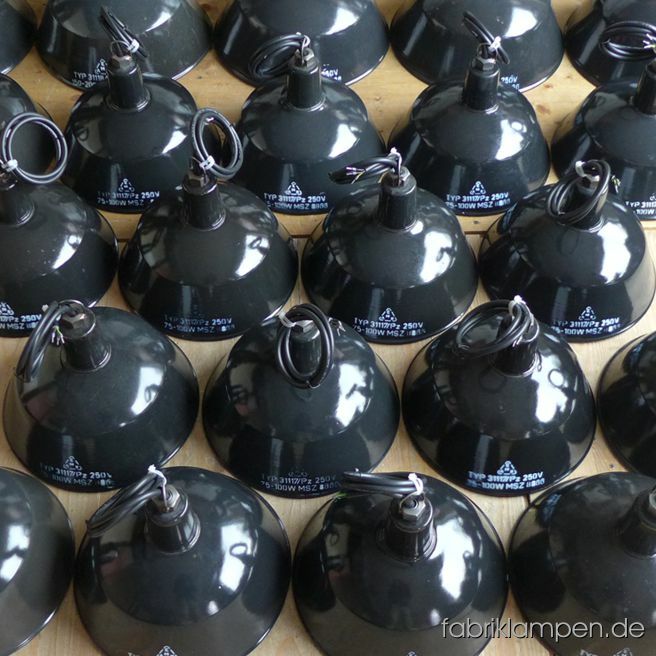 Nice group of smaller black enameled lamps with label for a bureau in Berlin. Diameter 25 cm. 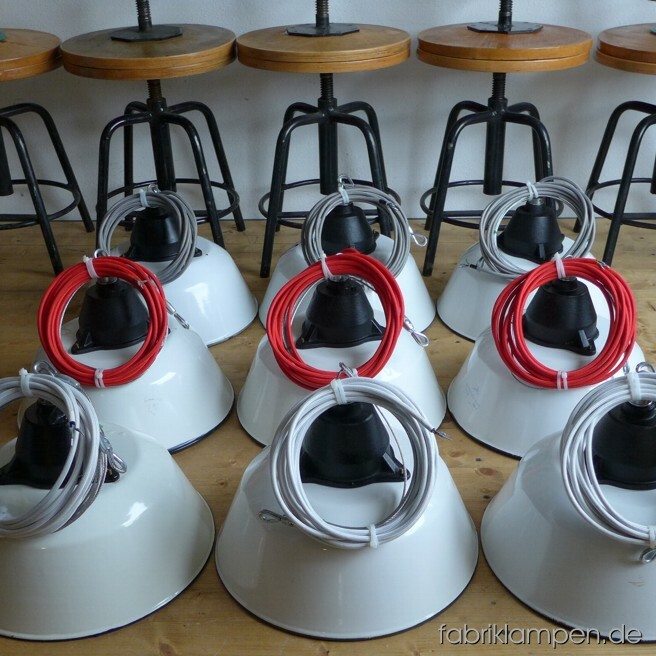 According to the to the customer’s wish: scissor lamps made of old shades with new scizzors for a coffeeshop in Vienna. Maximal length over 2 meters, diameter of the shades 36 cm. 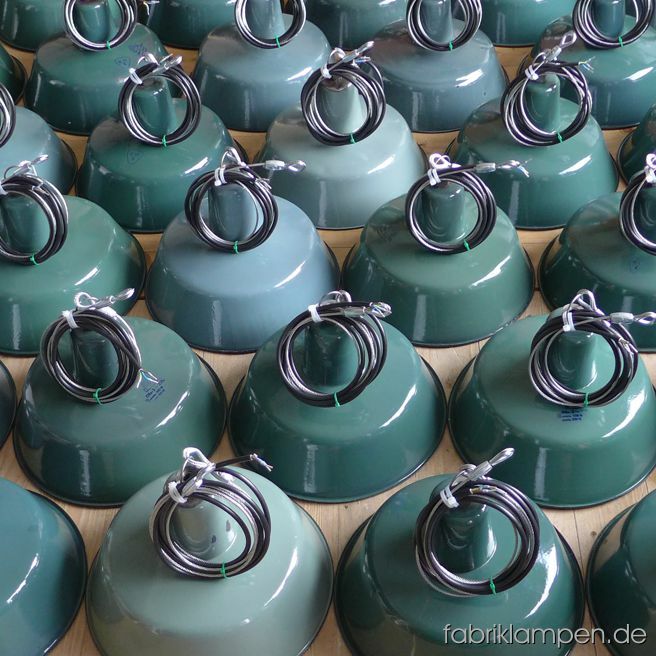 Nice group of bluish green (petrol blue) enameled industrial lamps for a bigger project in Hamburg. Very fine shade of the colour, diameter 41 cm. 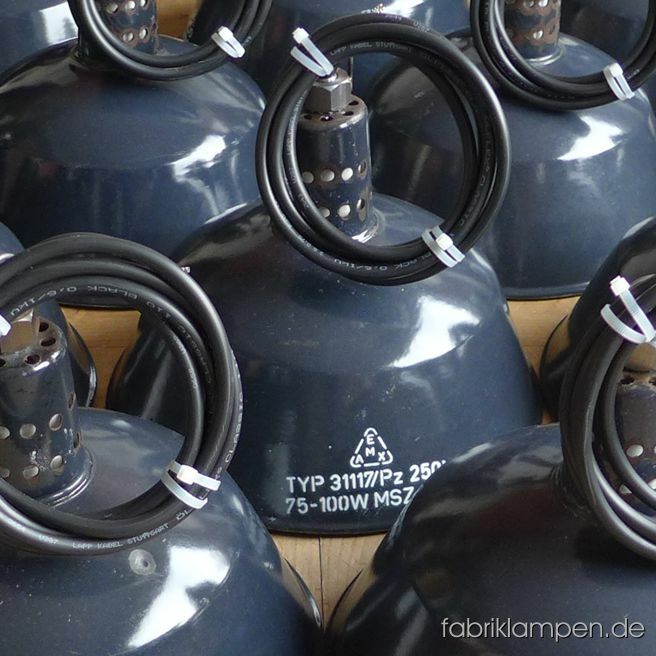 Nice group of casted iron factory lamps for a bigger project in Hamburg. 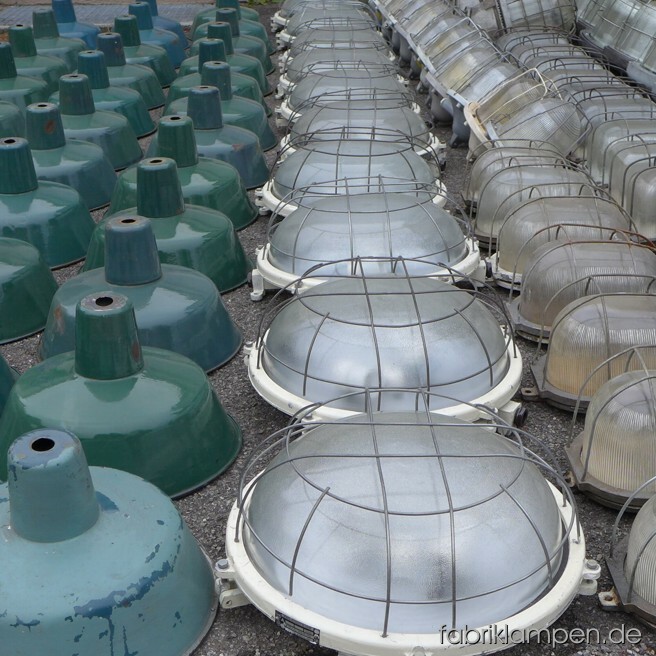 Nice group of casted iron factory lamps with glass & grid and green enamel shades. 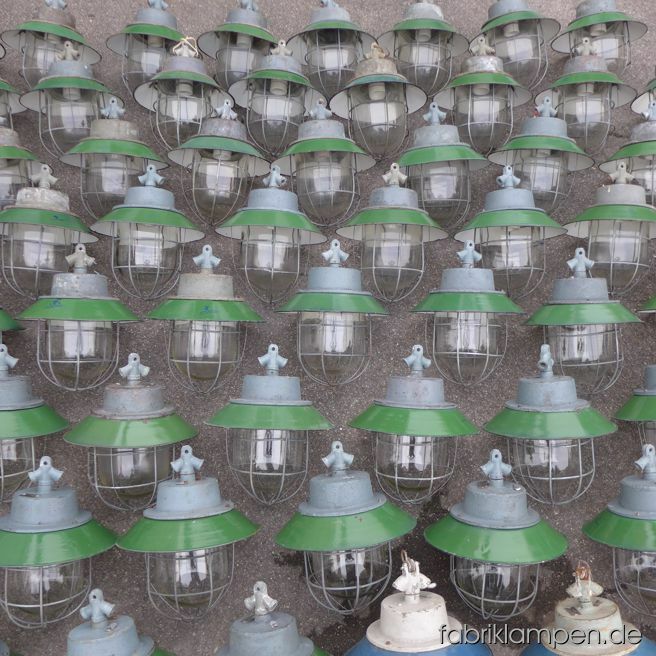 Group of enamel lamps with perforations in the neck. 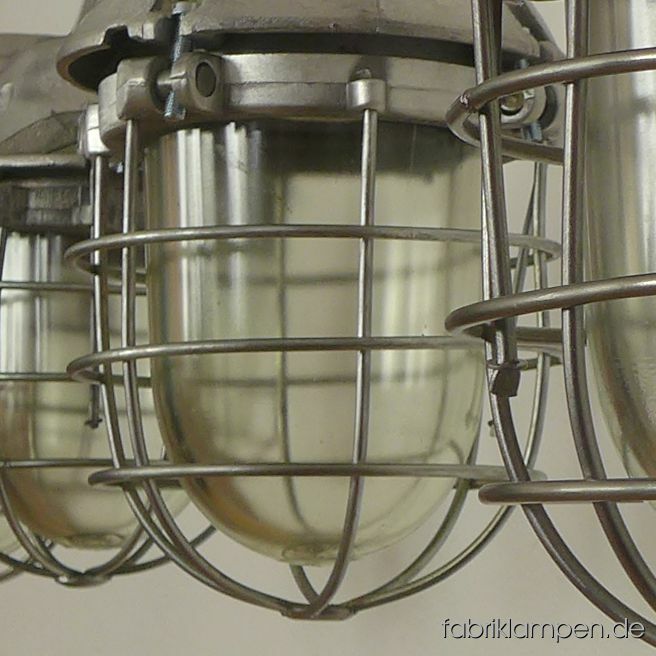 Group of casted iron lamps with safety glasses and grids & pale gray enameled shades. 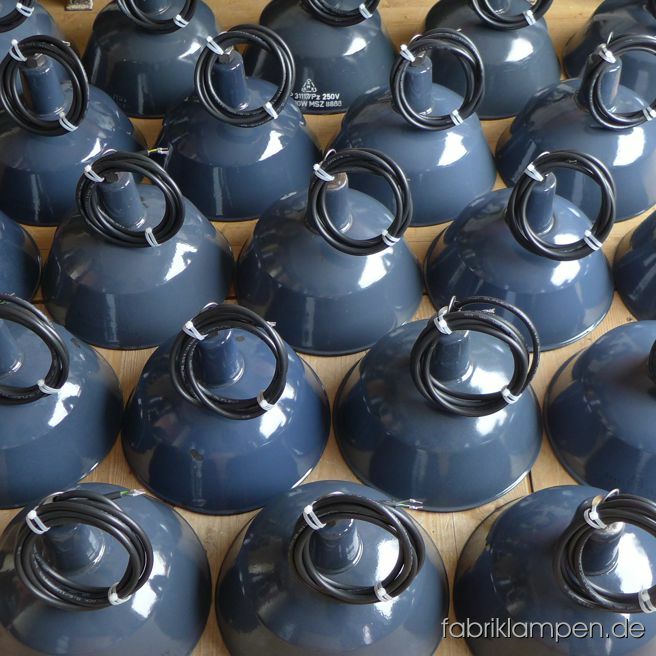 Group of grayish blue enamel factory lamps for a bigger project in Hamburg. 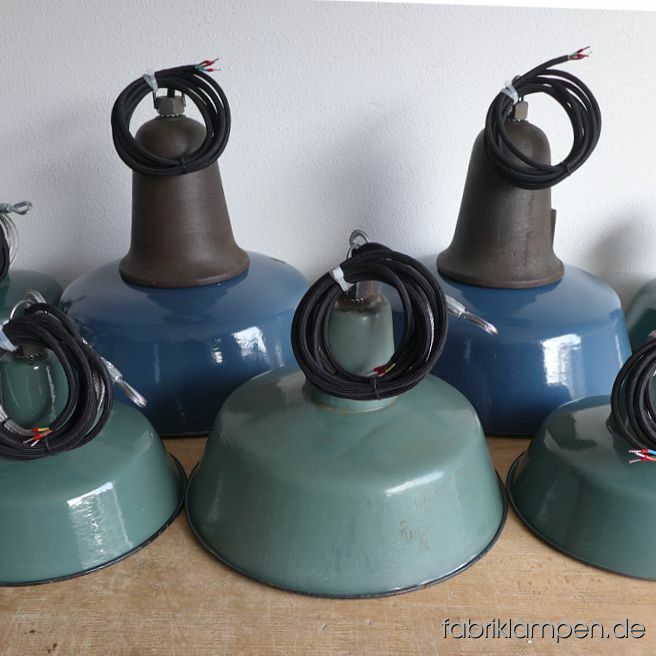 Nice group of old green and blue enamel factory lamps for a bureau in Austria. 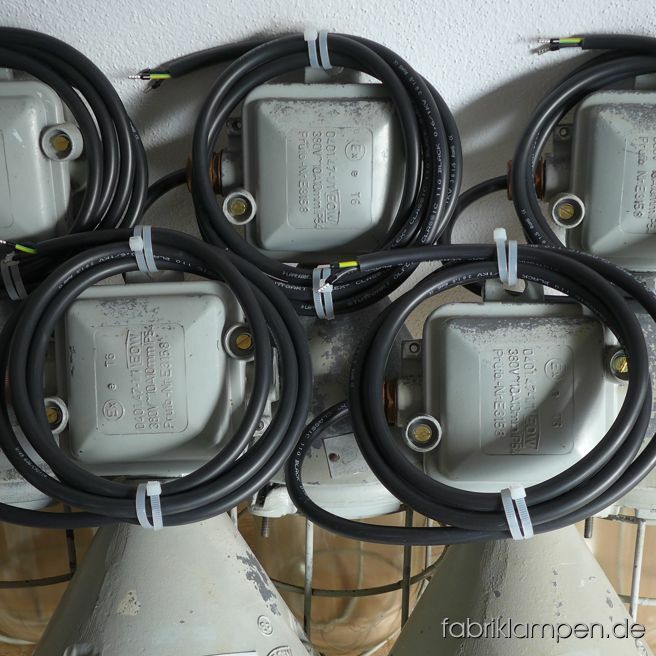 Nice EOW lamps (old explosionsproof bunker lamps/bullies) with distribution boxes for a project in Leipzig. 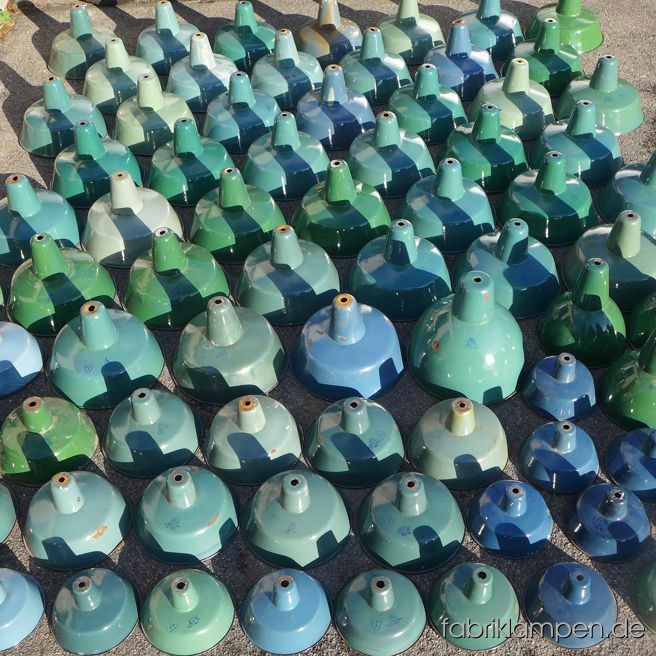 Nice collection of old green and blue enamel factory lamps after arriving. 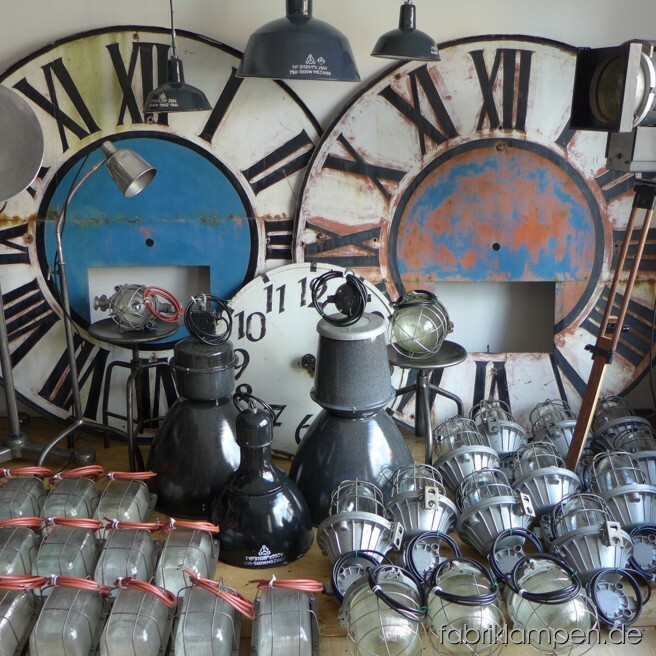 Nice collection of old enamel factory lamps for a restaurant in Schwitzerland. 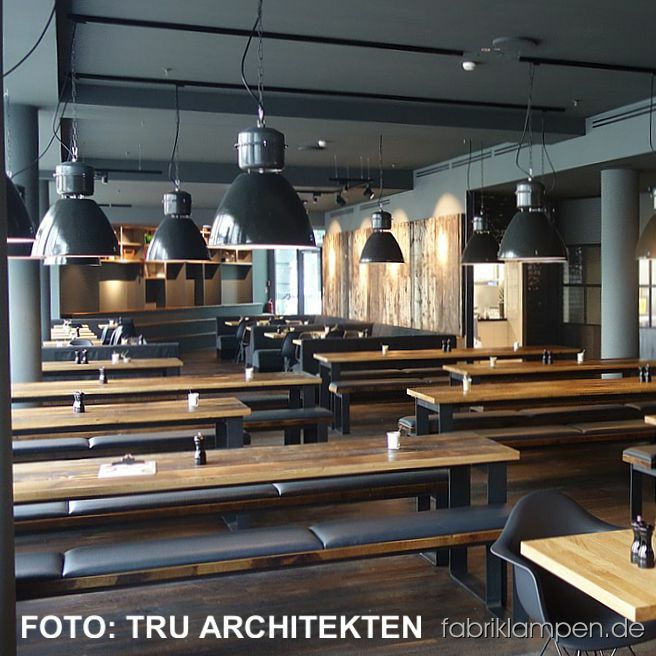 Nice collection of green enamel lamps for a restaurant in Osnabrück. 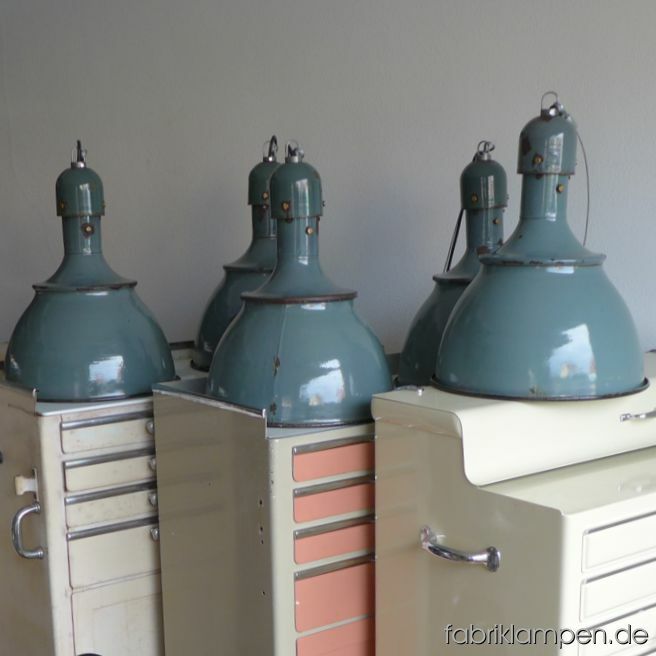 Some pictutes of the old green enamel lamps on old dentist cabinets. 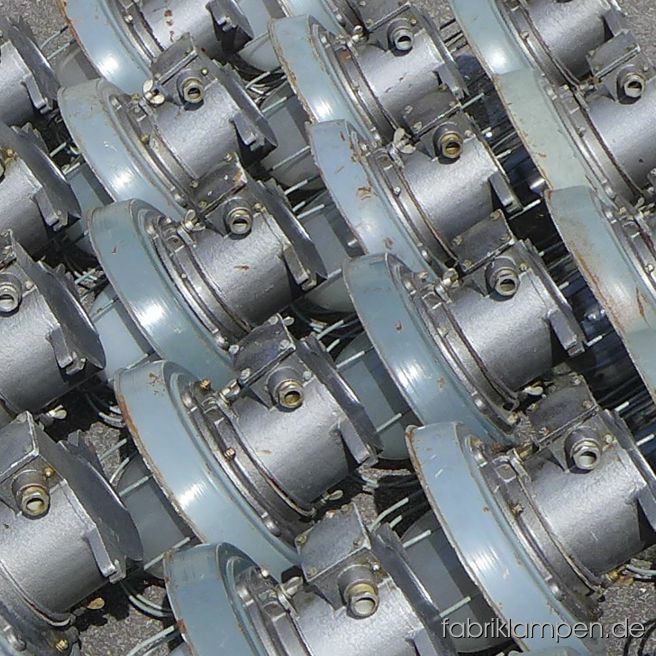 Nice collection of 100 pieces casted iron wall lamps (bunker lamps) after arriving. Details to the lamps you find here. 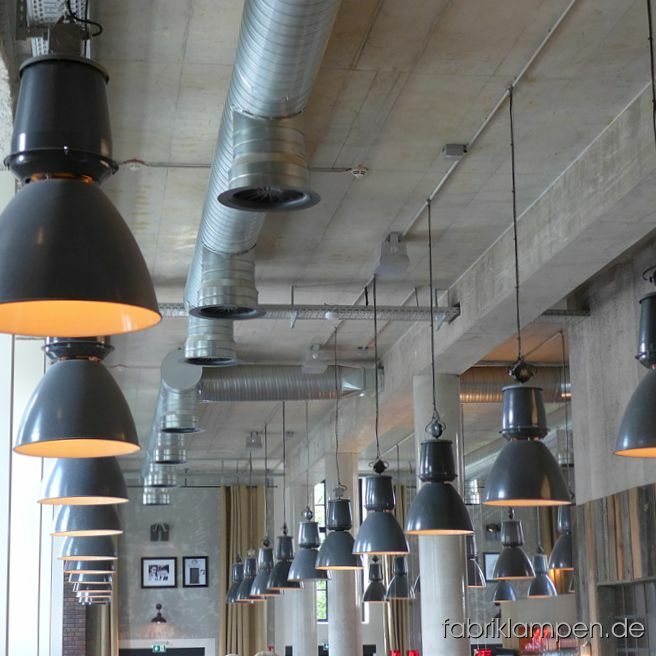 Nice collection of industrial lamps for a health food store in Munich. 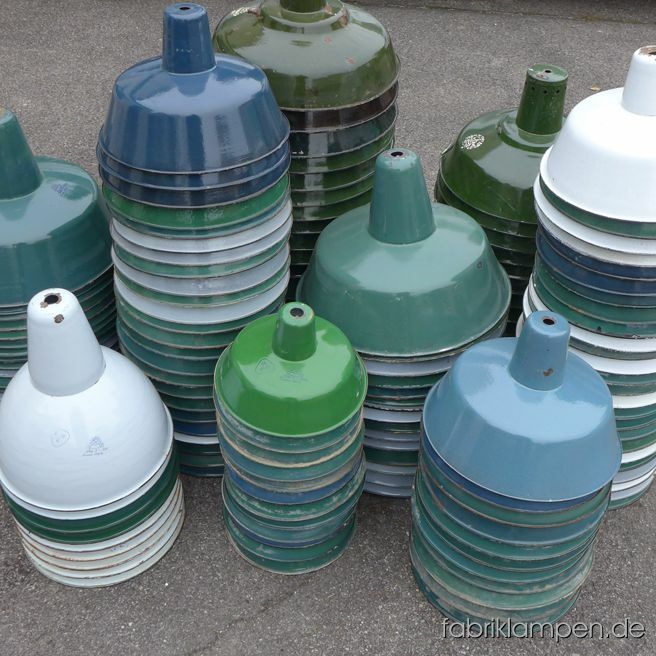 Nice collection of green enamel lamps – also in turquoise and petrol! 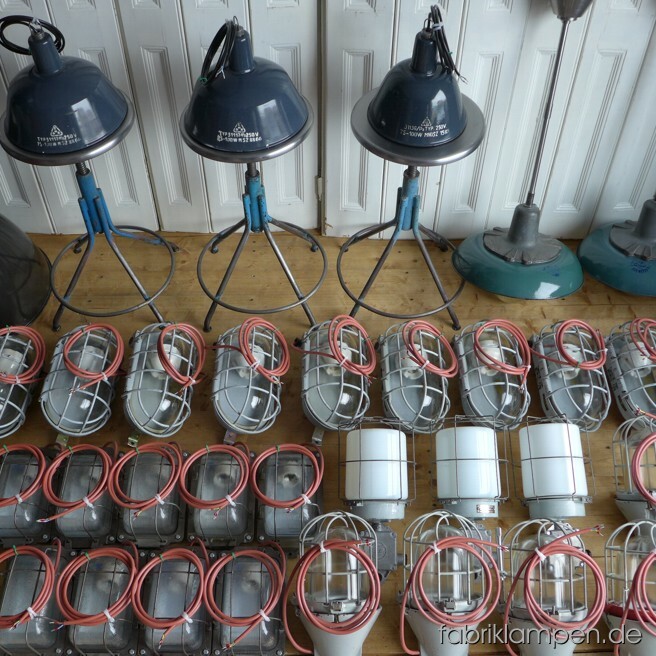 Nice collection of aluminium factory lamps after arriving. Details to the lamps you find here. 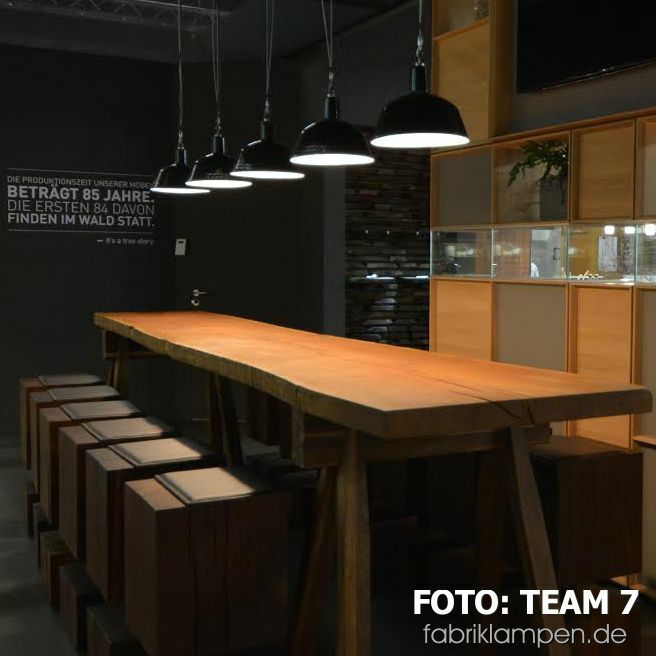 Noble furniture and old industrial lamps go well together: our lamps at the fair stands of TEAM 7 (IMM Cologne, Living Kitchen). 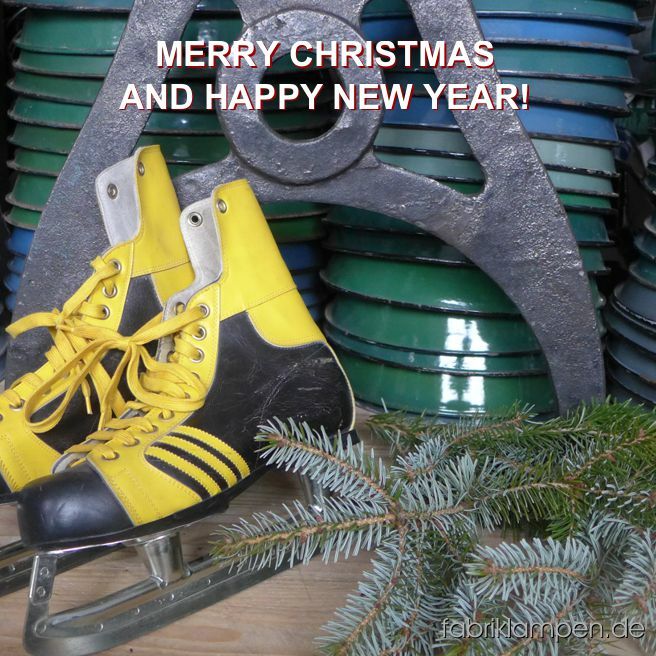 Thank you for the pictures and kind regards to Ried! 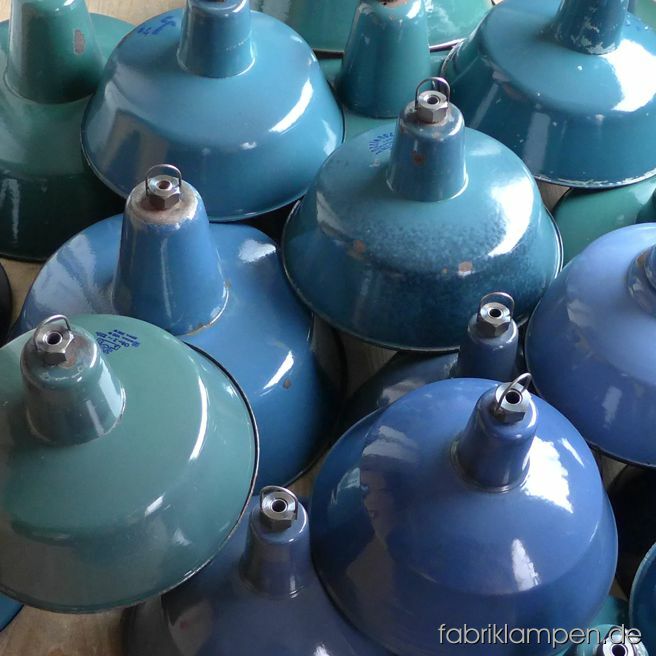 Nice blue industrial lamps before shipping. 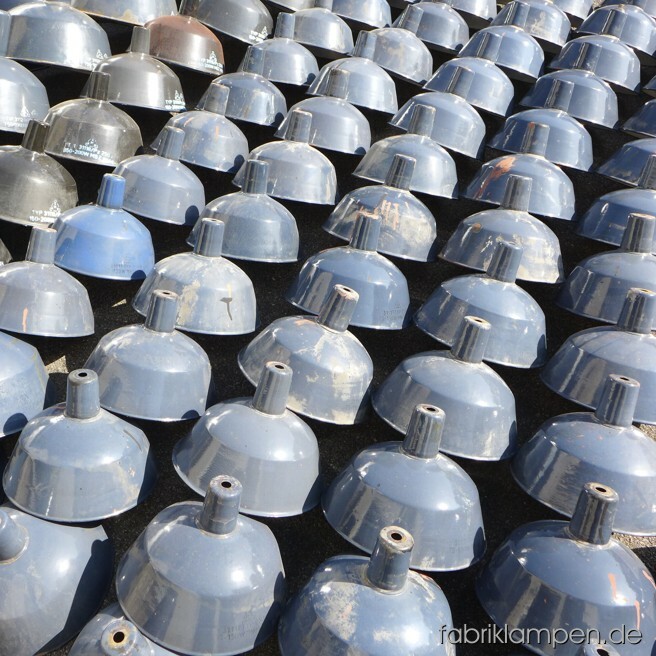 Nice collection of gray enamel bunker lamps after arriving. Details to the lamps you find here. Nice collection of old lamps after arriving. 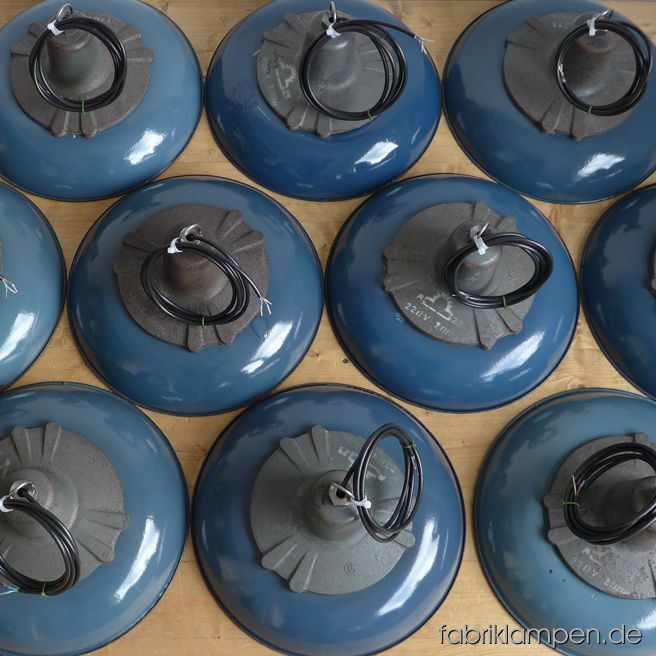 Nice blue enamel lamps with casted iron domes after arriving – currently we have about 40 pieces of this type in blue on stock. 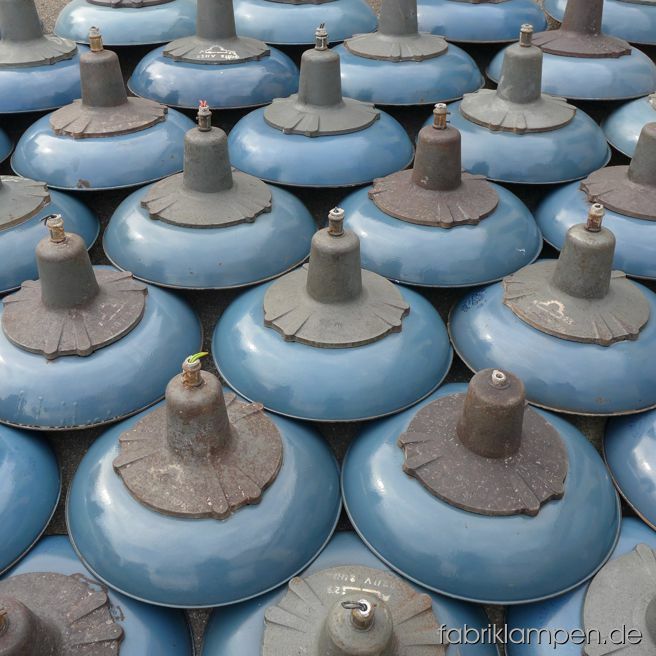 Nice colorful enamel lamps for the chocolate manufacture and shop XOKOLATL in Basel, Switzerland. Delicious! 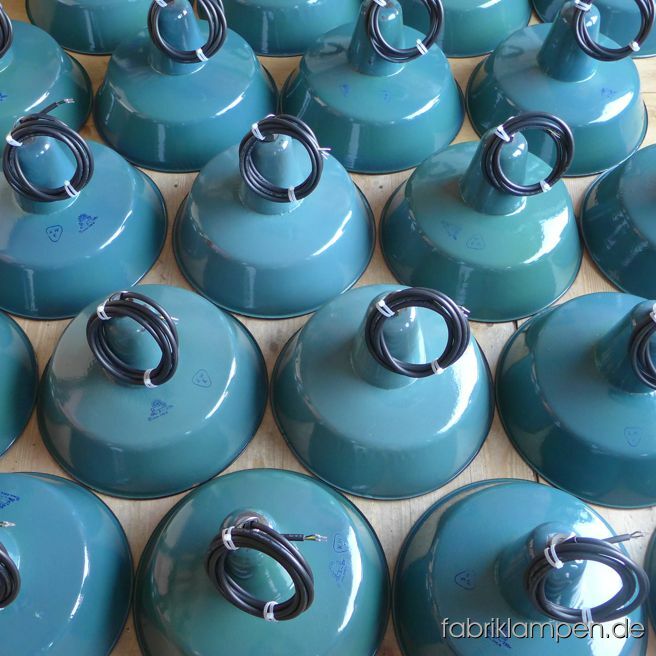 Nice green enamel lamps after arriving – currently we have about 80 pieces of this type in green on stock. 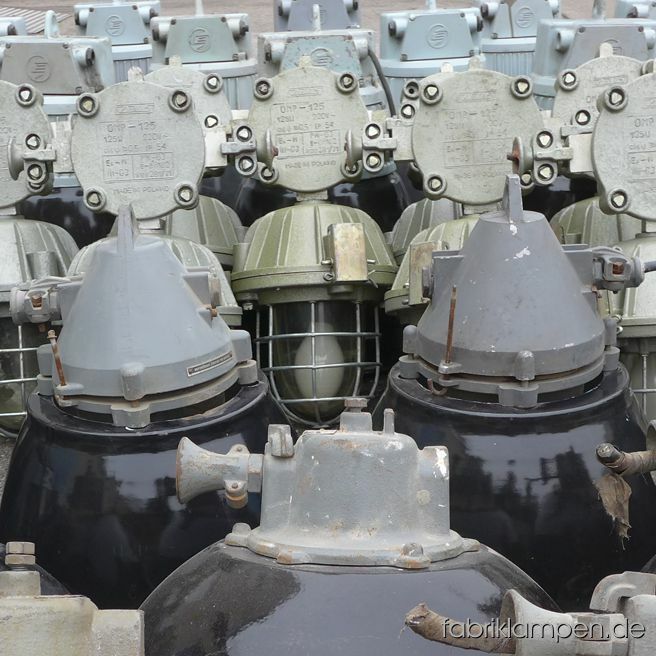 Nice bunker lamps and other industrial lamps before shipping. 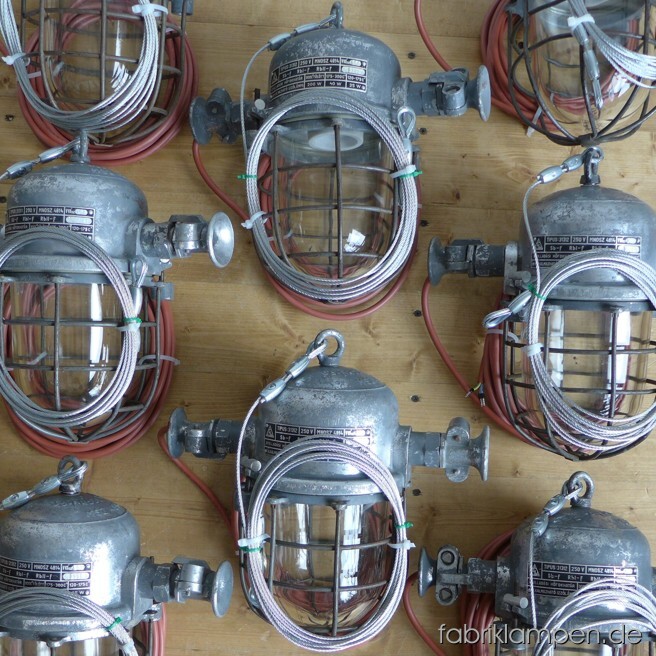 As usual, another industrial lamps arrived. 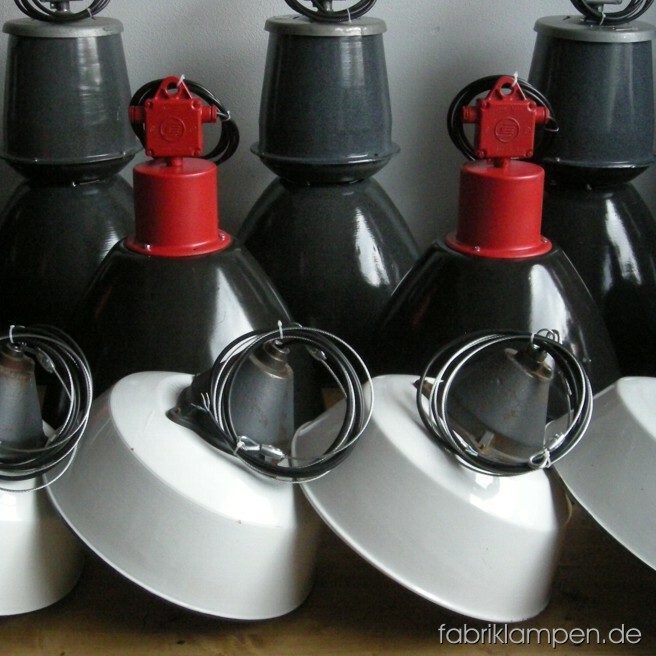 Here some bunker lamps, they are coming soon in our shop! 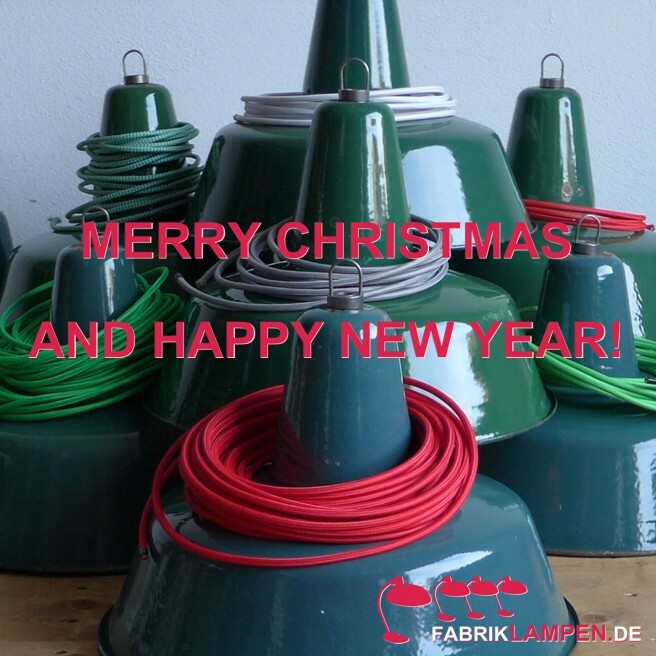 We wish our visitors Merry Christmas and Happy New Year with these old green industrial lamps. 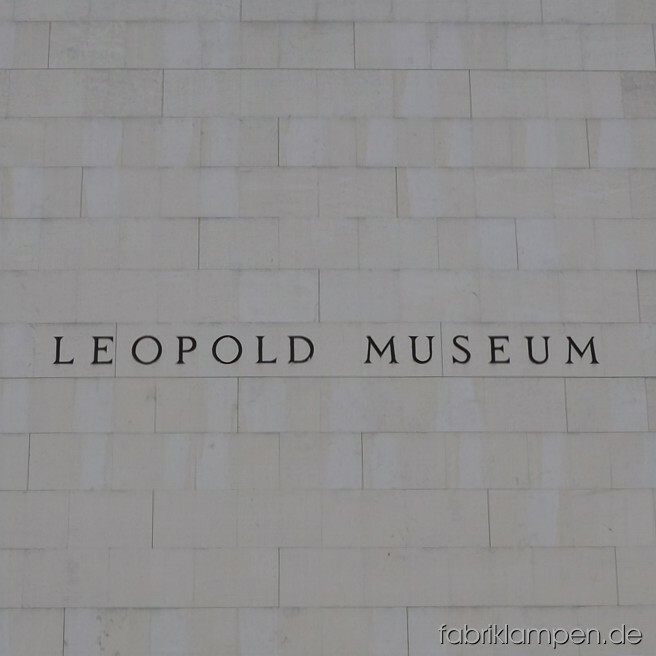 I would recommend everyone to visit the world-famous works of Alberto Giacometti in the Leopold Museum in Vienna (till end of January 2015). Above the sculptures and objects of the sculptor you can see our lamps. It was a big pleasure to get in contact with Warwick, cause I played Bass as a young man. 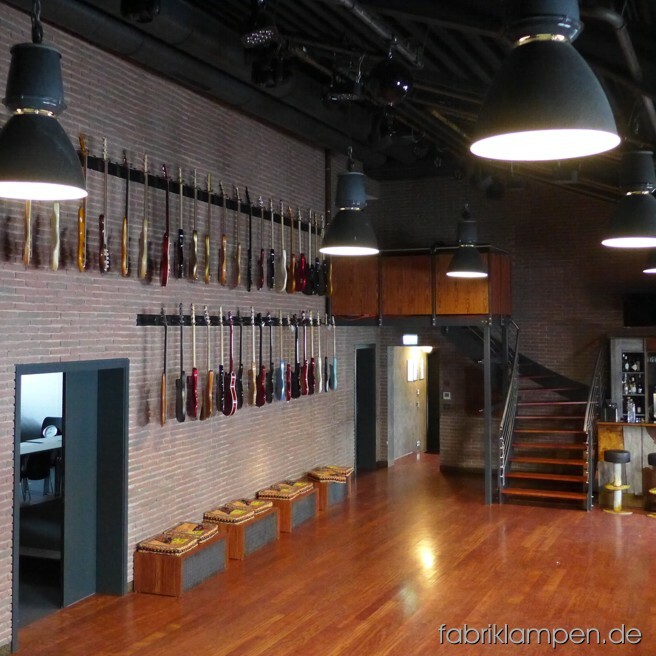 In summer 2014 we delivered 4 dozen lamps for the new Framus & Warwick Music Hall in the beautiful music town Markneukirchen. The Music Hall was finished and open in September 2014 an is classy like everything from Warwick. 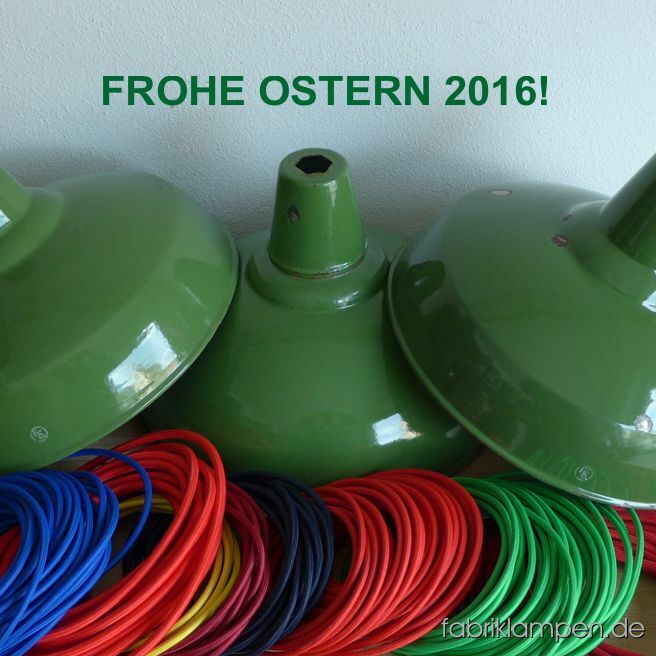 These nice white enamel lamps with colourful textile cables were this week delivered in the beautiful Altenberger Land (Linz, Austria). 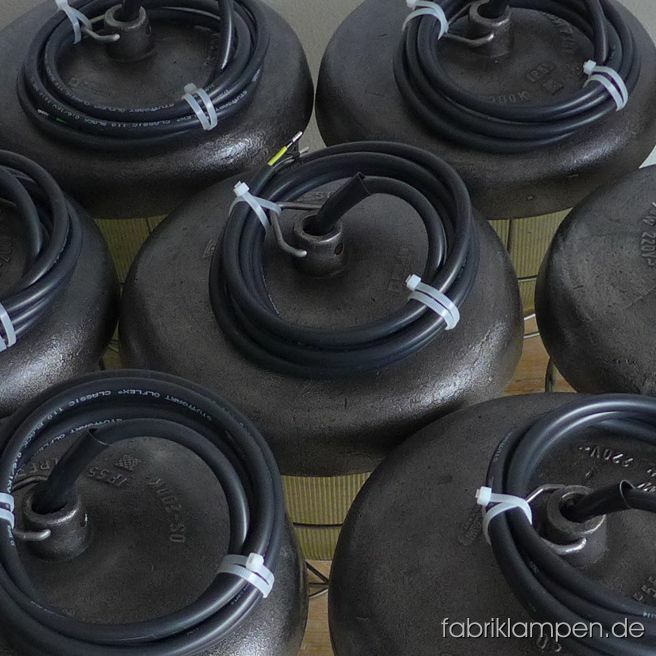 Betweenwhiles we assemble commissions with nice lamps – as from now we will publish pictures of some batches like this. These bullies will be mounted in the café of a private college in Germany. 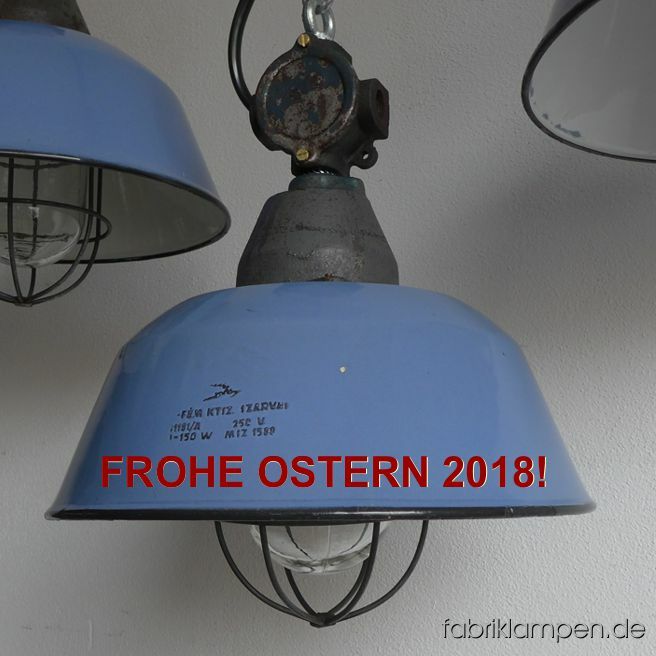 Since 20.09.2014 on stage in Schauspiel Frankfurt: Faith, hope and charity (Ödön von Horvath), above the strong scenery hang our industrial lamps. 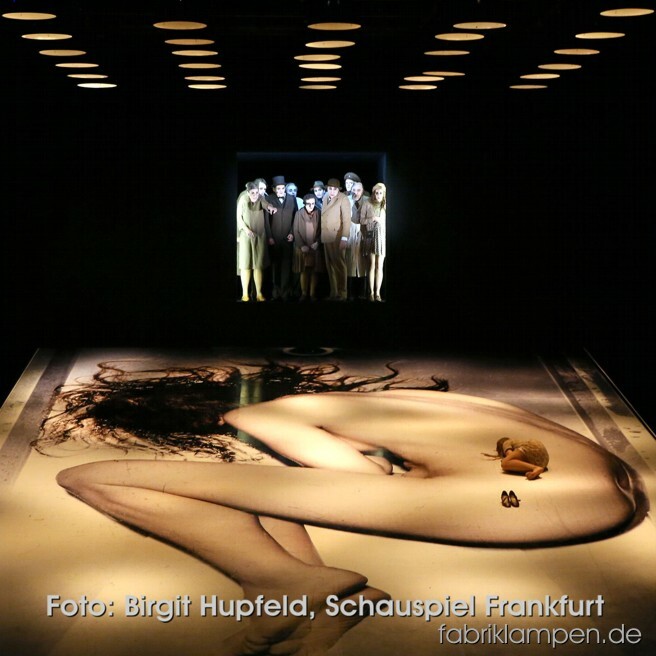 Foto: Birgit Hupfeld, Schauspiel Frankfurt – thank you very much! 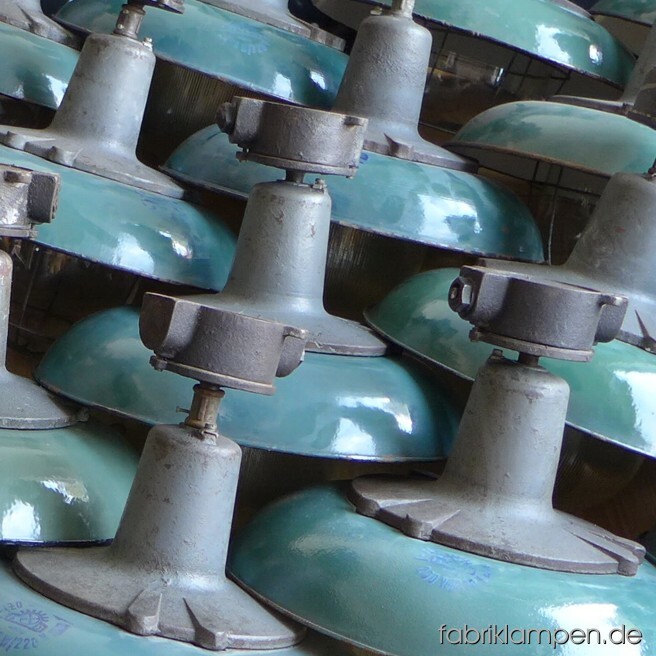 As usual, another enamel industrial lamps arrived. Very nice condition, they are coming soon in our shop! 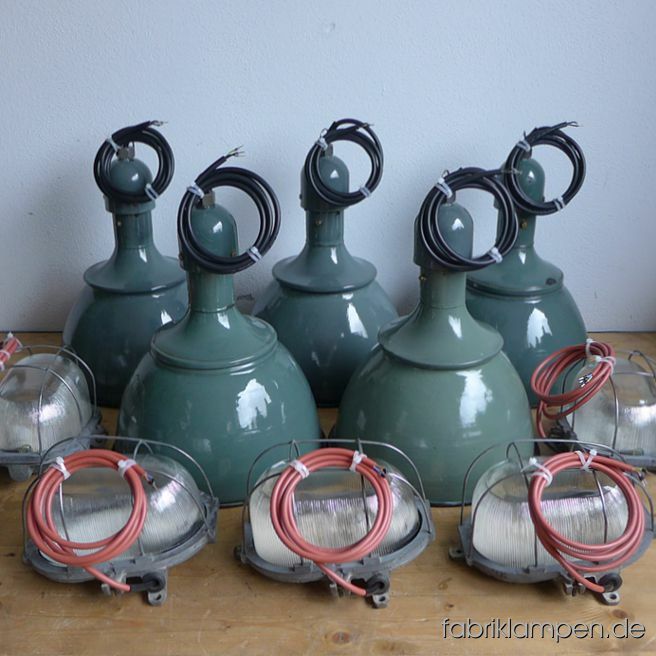 Nice green enamel industrial lamps with casted iron domes arrived. Very nice condition, they are coming soon in our shop! 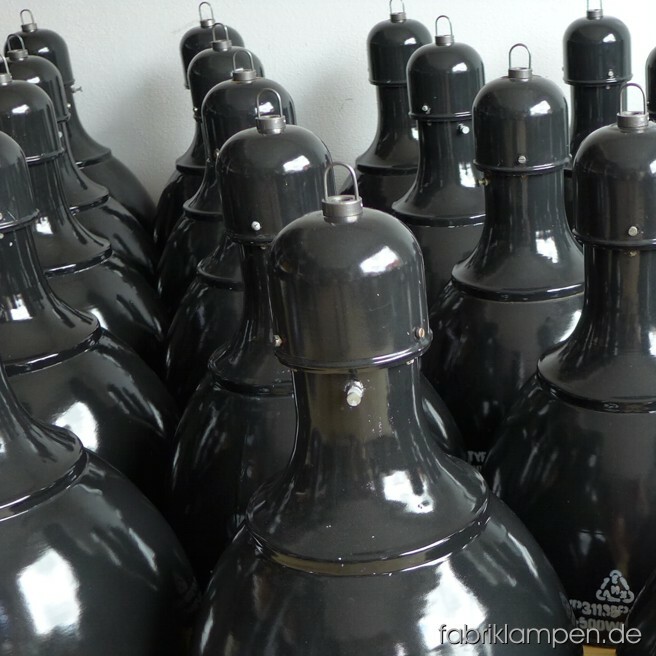 Wonderful preserved black enamel industrial lamps arrived. Such a batch is hardly to find. 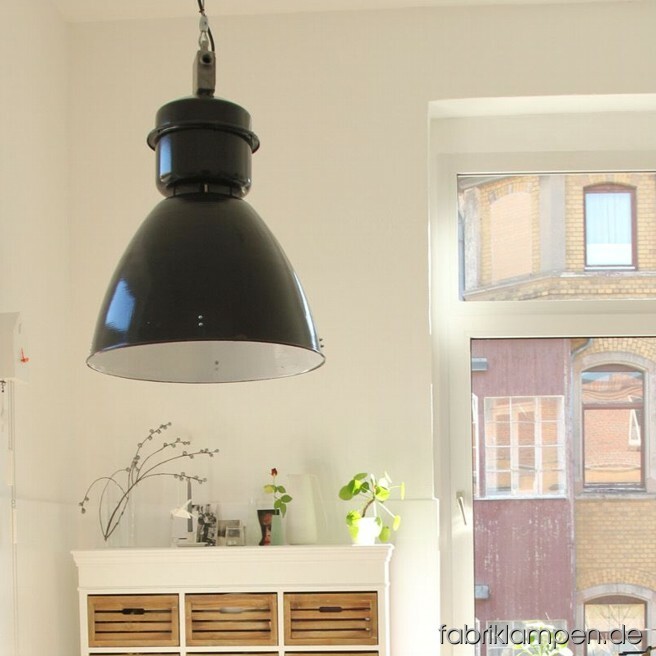 You find these lamps in our shop (click here). 3 old church clock faces arrived. 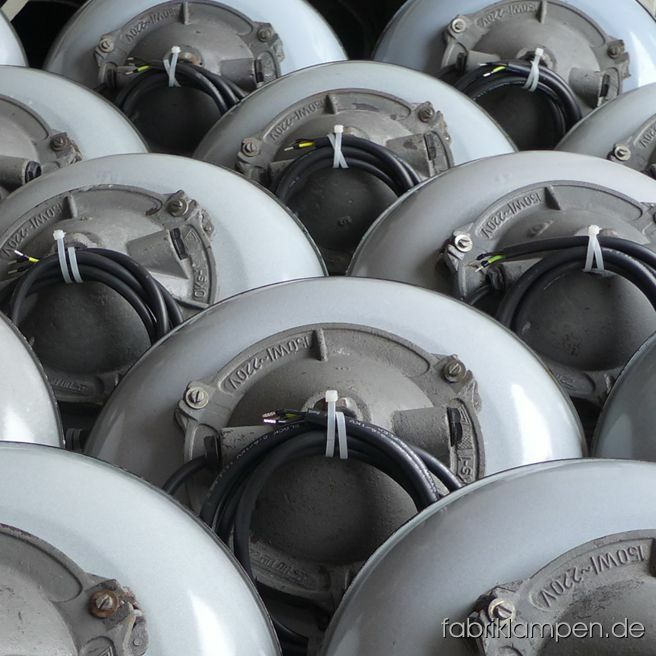 The smaller one with 83 cm diameter has the original hands gears, the big ones have a diameter of 170 cm – a really eyecatchers! 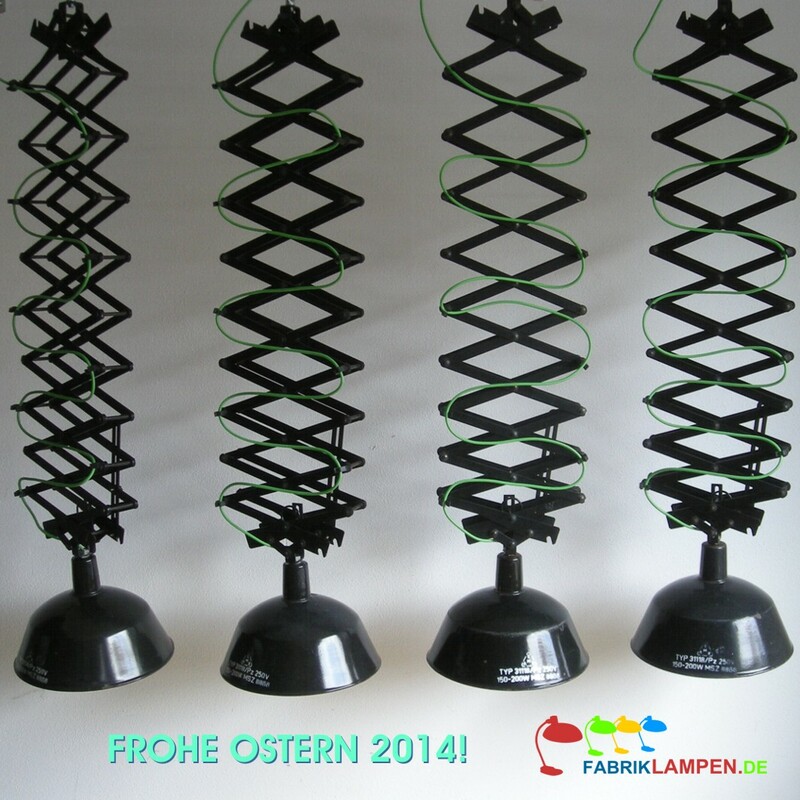 We wished happy Easter 2014 our visitors with these old scissor lamps mounted with green textile cord. 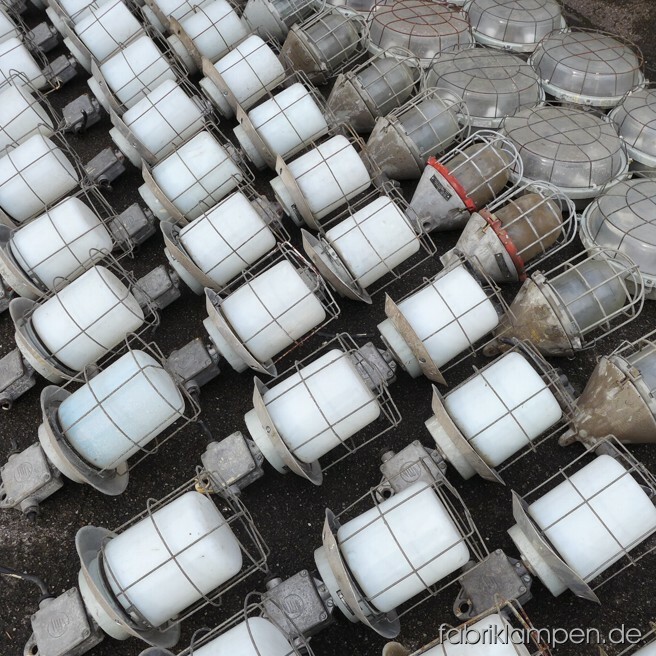 Colour-impressions with industrial lamps, April 2014. 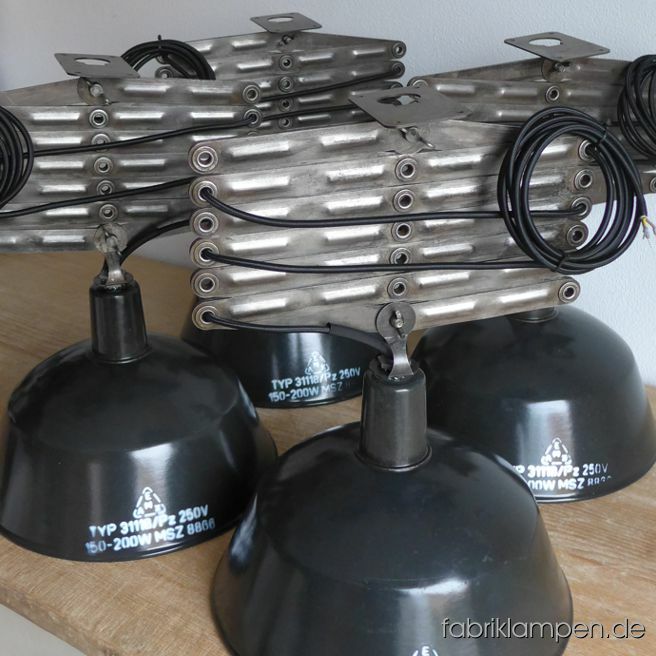 Our old factory lamps can be found besides many households in restaurants, bars, bakeries, event locations, bureaus, fitness centers and shops. We work together with consulting engineers and interior designers. 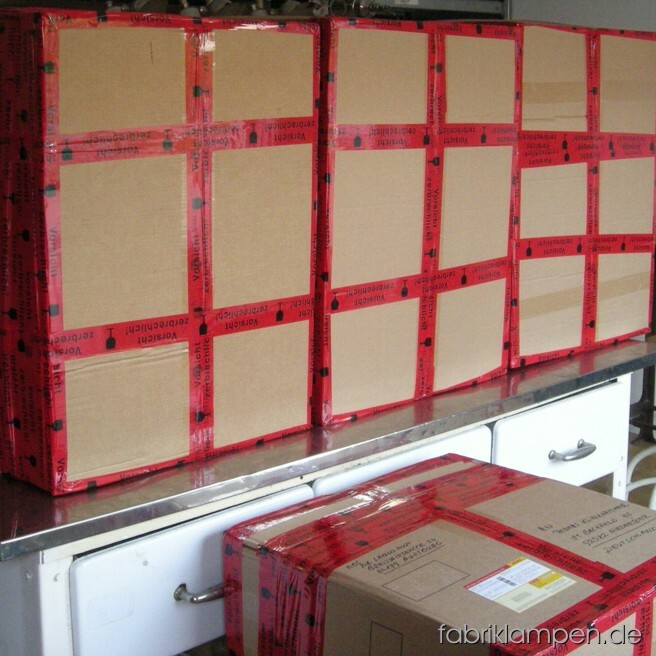 We deliver to theatres like Semperoper, Oper Frankfurt, Schauspiel Frankfurt, Theater Heilbronn, Teatro Real. 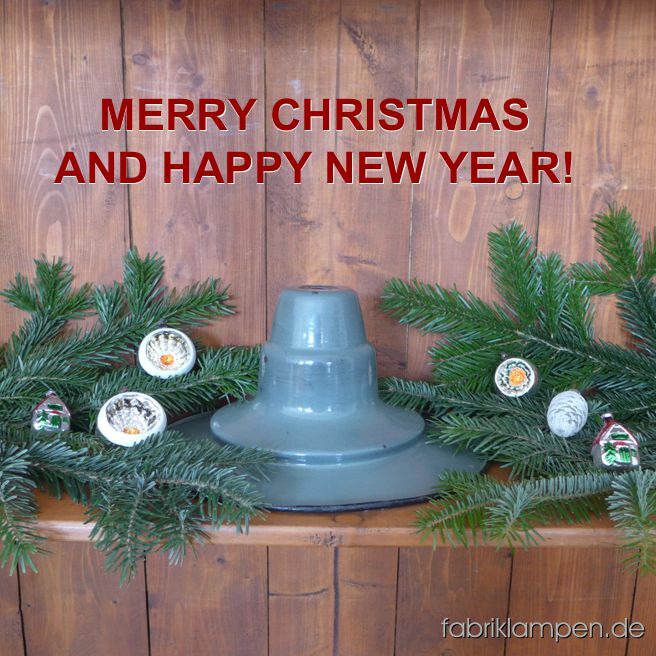 We wished our visitors Merry Christmas 2013 with these old industrial lamps. 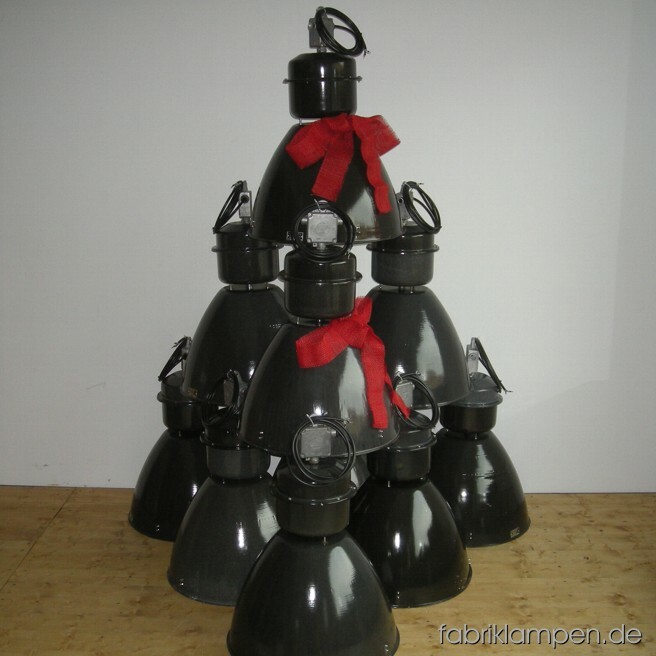 We ship our industrial lamps worldwide. 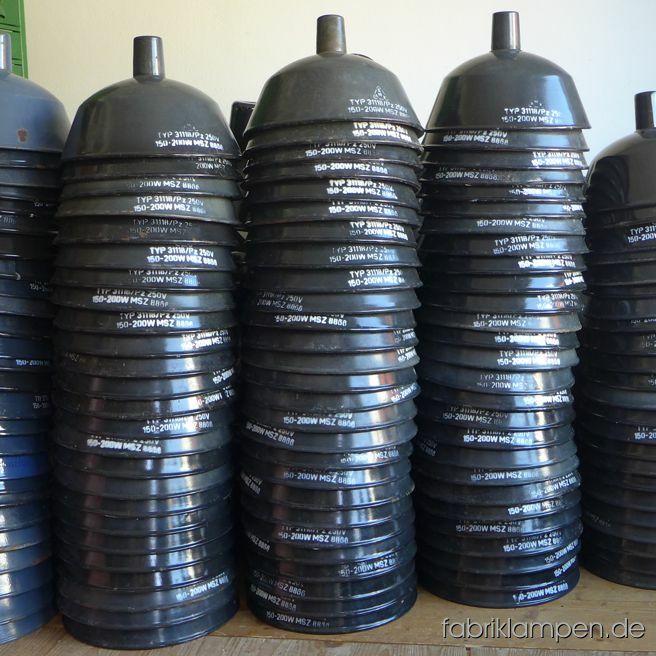 Our lamps will be demounted to the last screw, cleaned and professional mounted.